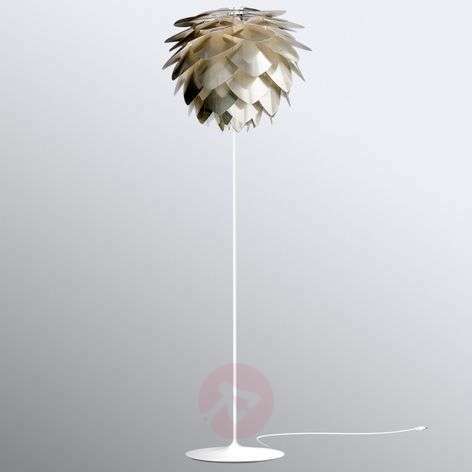 Triangular leaves made from unbreakable plastic define the appearance of the lampshade of the floor lamp Silvia media, causing it to resemble an exotic plant in its overall appearance. This modern classic fits into any interior design style and acts as a decorative eye-catcher even when it is turned off. As soon as the light is turned on and shines through the gaps between the leaves, a fascinating lighting effect is created, which adds atmosphere to the entire room. The lampshade design comes from the Vita design team, whilst the stylish floor stand was designed by Anders Klem, a Danish designer who has dedicated himself to designing modern lights. The white frame brings the colour of the lampshade, which has a brushed brass finish, into the foreground. Beneath the socket is a decorative brass switch which can be used to switch the Silvia medium floor lamp on and off. A high-quality designer product, produced by the Danish company UMAGE, which is known for aesthetic lighting creations in a Scandinavian design.